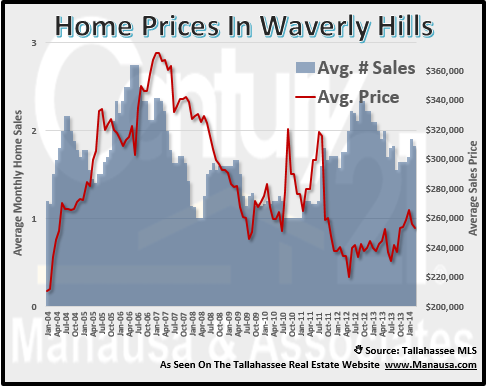 The pace for home sales in Waverly Hills has been slowing since reaching a peak in October of last year, and lately home values and home prices have been giving back some of their 2013 gains as well. 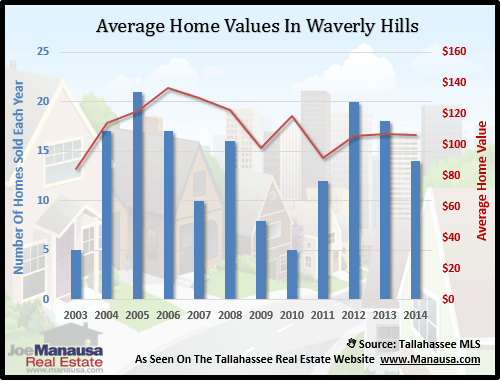 As a top-selling neighborhood in Tallahassee (along with Southwood, Golden Eagle Plantation, Killearn Estates, Killearn Lakes Plantation and Bull Run), it is important to watch Waverly Hills to stay on top of the changing trends for the entire Tallahassee real estate market. Thus far in 2014, there have been 4 homes sold in Waverly Hills, with an average sales price of $193,000 and a value of $91 per square foot. That means you are getting a 2,124 square foot home for just over $190K inside of I-10 off Thomasville Road. Currently, there are 5 homes for sale in Waverly Hills, and those that are priced well and marketed well are selling fast. There has only been two distressed home sales in Waverly Hills in the past two years, which is very rare for a neighborhood that is active enough to post 20 or so home sales per year. But this amount of activity means there will be lots of "noise in the data," as extreme outlier sales will skew the data. This is very true in Waverly, where the older homes that have not been renovated sell well below $100 per square foot, but modernized homes have sold as high as $145 per square foot. With only a few sales each month, we can expect the "average" to bounce around quite a bit. Home prices have fallen this year as well, and also due to the fluctuation in home condition/renovation that buyers will find. Waverly Hills is a dynamite in-town location, so expect to see this neighborhood be super-active for home builders who come in and modernize them with all the new bells and whistles. The following map shows the Waverly Hills homes that are on the market today. If you want more information on a particular home, simply click on the marker on the map and it will open up the listing to show you up to 25 pictures of each home. The following is a list of all homes sold in Waverly Hills (recorded in the Tallahassee MLS). I hope you were able to learn something from this Waverly Hills Home Sales Report, please drop me a note if you have any other questions or concerns that I can help you with.